Barret Benson looks to move the ball. 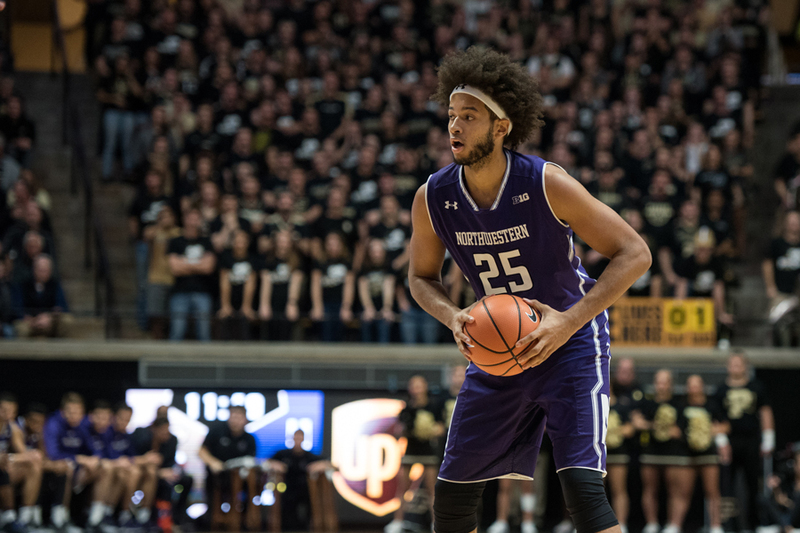 Despite his 9 points and nine rebounds, NU’s season ended with a Big Ten Tournament loss. NEW YORK — In a season laden with injury absences by star players and late collapses in crucial games, it was undeniably fitting that Thursday’s game was determined by star senior Scottie Lindsey disqualifying and Northwestern subsequently falling apart. After Lindsey picked up his fifth foul with 3:14 left, seventh-seeded Penn State instantly blew a 1-point game wide open and ultimately defeated 10th-seeded Northwestern 65-57 in the second round of the Big Ten Tournament. The Wildcats (15-17, 6-12 Big Ten) finish the season having lost their last seven consecutive games — despite holding second-half leads in five of them. Lindsey scored 12 points on 4-of-13 shooting Thursday, junior center Dererk Pardon led NU with 14 points and sophomore center Barret Benson, making his first start of the season, set his season high with 9 points and brought down a team-high nine rebounds. Junior forward Vic Law and junior guard Jordan Ash both missed the game with injuries for the Cats, while Penn State (20-12, 9-9) also played without its third-leading scorer, 6-foot-9 forward Mike Watkins. Coach Chris Collins said that because of his shorthanded roster, Watkins’ absence and the ongoing losing streak, he decided a change of strategy was in order. The power game was partially effective, as NU ground out a 22-14 advantage in points in the paint and essentially equaled a tall Nittany Lions team on the glass. But it also was partially ineffective, as the combination of playing two centers for much of the game and being unable to guard shooters man-on-man in Collins’ favored zone defense left Penn State often open behind the arc. And hit shots the Nittany Lions did. Garner buried four 3-pointers, Josh Reaves chipped in three of his own and Big Ten leading scorer Tony Carr erupted for a season-high six bombs — en route to a 25-point day — as Penn State went 13-of-29 from deep, overcoming the Cats’ advantage inside. Penn State, however, found that its late surge was enough to advance to a Friday date with second-seeded Ohio State and guarantee another game in the famed confines of Madison Square Garden. The Cats, meanwhile, finished their season — one that began with their first-ever appearance in the preseason top 25 poll — with just 15 total wins, nine fewer than last year and tied for the second fewest since Collins’ debut campaign in 2013-14.